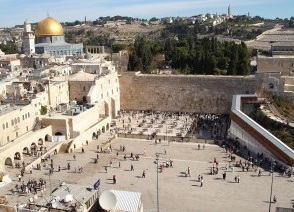 The Temple Mount in Jerusalem is the most contested land in the world, and for good reason. Two of the world’s monotheistic religions lay claim to the site but for different reasons. The Temple Mount is considered by Jews to be the site of both Solomon’s and Herod’s temples, and the ancient location of the holiest site on the planet, the Holy of Holies, that place where the presence of God literally dwelt. 1 Kings 8:11 NASB. To Muslims, the “Haraam al-Sharif” (translated, “Noble Sanctuary”) is the location of the Dome of the Rock1 and al-Aqsa Mosque. (Read more). The entire site is considered a mosque in Islam. Further, to Muslims, the site is where Abraham bound Ishmael, his first-born son by Hagar, for intended sacrifice. Hagar was Abraham’s slave woman to whom a barren wife, Sarah, bedded her husband. Genesis 16:2 NASB. To Christians, Hagar was the bondwoman of the flesh (Galatians 4:22-23 NASB). To Jews, it was not Ishmael that was bound, but Isaac, the second-born of Abraham and the son-of-promise by Sarah, his wife (Genesis 17:19). These two sons are the fathers of two ancient peoples, Arabs and Jews, and the enmity that has existed since the days of their youth (Psalm 83:2-8 NASB) continues to fuel conflict in the modern day. 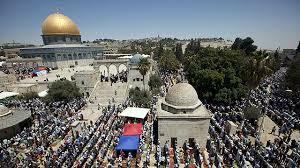 Extending prayer-rights to Jews on the Temple Mount is like throwing gasoline on a roaring fire to Palestinians. Any such action is one-step closer to the rebuilding of the 3rd Temple, an act that will necessitate the destruction of the Dome of the Rock and Al-Aqsa Mosque, Islam’s two holy sites on the Mount. Such an occurrence will, no doubt, usher in World War 3. In a recent article by the Economist, Jewish prayer-rights advocates were labeled as “militants.” Apparently, Jews visiting the Temple Mount (Jews can visit the Temple Mount but not pray) did so while holding their cell phones pretending to speak, all the while “praying surreptitiously.” Why liken Jewish prayer-rights advocates to “terrorists,” i. e., “militants”? Because its not about prayer. Its about ultimately removing the two Muslim holy sites because they are “standing where they should not be” (Matthew 24:15 NASB, Mark 13:14 NASB). In their place, the rightful holy Temple will one day stand — the Third Temple, the Millennial Temple; but that day will not come until the world is cleansed in the Great Tribulation and the second coming of the only Begotten Son (Revelation 19:11-18 NASB). The nations of the world may be circling for the kill, but they have yet to gather against Israel. Zechariah 14:2-3 NASB. Makes you wonder though — Will the Temple Mount ultimately be used by God to gather the nations for judgment (Daniel 11:45)? Only time will tell. In the meantime, every time a Jew’s cell phone is really a concealed prayer while strolling the Temple Mount, we are likely one day closer to the Great Tribulation and the second coming of our Lord. As always Dr Jack, you have a God given ability to get right to the heart of the matter. Many thanks from your faithful readers. You turn up in our prayers often. Blessings to you and yours! Thank you, Mike for the encouraging words. Always.